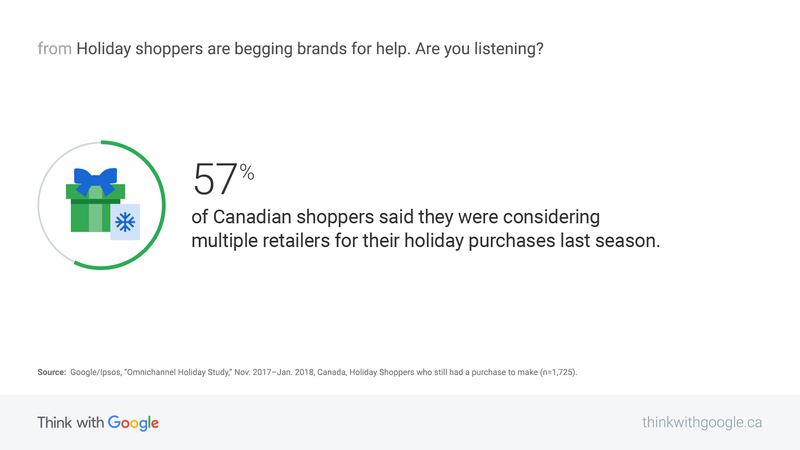 Today, 73% of Canadian holiday shoppers over 18 use three or more channels.1 That’s a huge number of people searching on their smartphones, visiting retailer sites, or going into a store to uncover new brands and products or rediscover old favourites. But with so much choice at their fingertips, folks are finding holiday shopping overwhelming. To cut through the clutter and feel confident in their choices, these shoppers are begging for help. 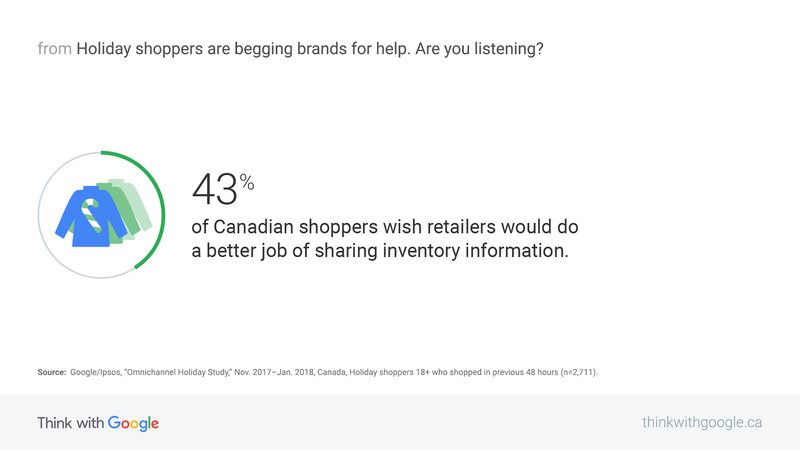 Source: Google/Ipsos, “Omnichannel Holiday Study,” Nov. 2017–Jan. 2018, Canada, Holiday shoppers who still had a purchase to make (n=1,725). We’ve taken a look at recent shopping behaviour trends to see how brands can better assist shoppers with navigating this bustling shopping period. So, grab an eggnog and read on to learn how people want help this holiday season. Research shows that 57% of Canadian shoppers said they were considering multiple retailers for their holiday purchases last season.2 This year, we’re seeing that people are more open to discovering and trying new brands than ever before. With so many customers undecided, the discovery phase in the path to purchase is critical. Assist potential customers when they need you, and focus on mobile. Sources: Google/Ipsos, "How People Shop with YouTube Study,” July 2018, Canada, 18–64 year olds who go online at least once per month and have purchased something in the last year (n=2,400); Google/Magid Advisors, "The Role of Digital Video in People’s Lives,” July 2018, Canada, US, Ages 18–64, general online population (n=2,000). We’re also seeing that shopping is not centralized to the typical promotion days like Black Friday or Cyber Monday. People are always shopping — before, during, and after the holidays. In fact, only 13% of holiday shoppers consolidate their shopping to the Black Friday to Cyber Monday period,5 and by that period, shoppers had completed 42% of their holiday shopping.6 An always-on strategy is critical to reach people whenever they need you — not just when it suits your campaign calendar. Brands wanting to win over this year’s holiday shoppers must take note: one-size-fits-all is no longer acceptable. Listen to your customers. Anticipate what they want. And deliver it to them in a personalized and seamless way. With more to do and less time to do it, people want their shopping experiences to be frictionless and efficient, especially over the holidays when there are so many other things taking priority (that pumpkin pie isn’t going to eat itself). To help get things done, these shoppers rely heavily on technology. Google/Ipsos, “Omnichannel Holiday Study,” Nov. 2017–Jan. 2018, Canada, Holiday shoppers 18+ who shopped in previous 48 hours (n=2,711). Don’t let the holidays be a headache for your customers. If you provide relevant, personalized, and efficient assistance, you’ll stand out from the crowd. Start by asking yourself: Will I be giving my customers the help they need this holiday season? Doing so could be a big step toward reaping long-term customer loyalty and business growth. 1 Google/Ipsos, “Omnichannel Holiday Study,” Nov. 2017–Jan. 2018, Canada, Holiday shoppers 18+ who shopped in previous 48 hours (n=2,711). 2 Google/Ipsos, “Omnichannel Holiday Study,” Nov. 2017–Jan. 2018, Canada, Holiday shoppers who still had a purchase to make (n=1,725). 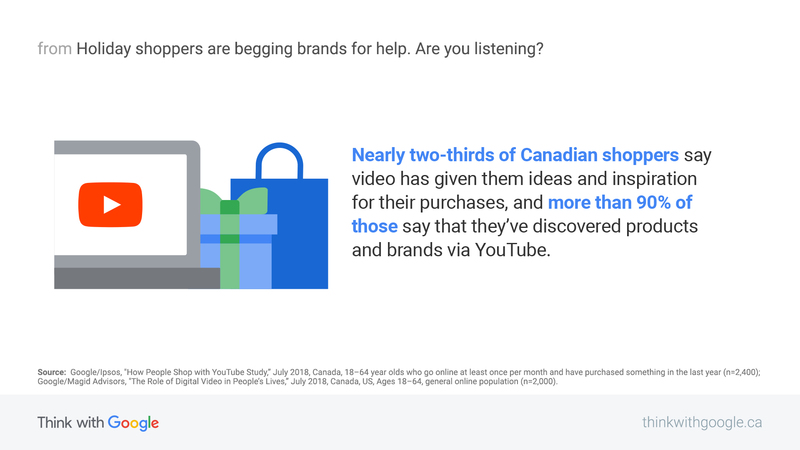 3 Google/Ipsos, "How People Shop with YouTube Study,” July 2018, Canada, 18–64 year olds who go online at least once per month and have purchased something in the last year (n=2,400). 4 Google/Magid Advisors, "The Role of Digital Video in People’s Lives,” July 2018, Canada, US, Ages 18–64, general online population (n=2,000). 5 Google/Ipsos, “Omnichannel Holiday Study,” Nov. 2017–Jan. 2018, Canada, Holiday shoppers Early Birds (n=703), Deal Seekers (n=351), Evergreen (n=1,048), Last Minute (n=609). 6 Google/Ipsos, “Omnichannel Holiday Study,” Nov. 2017–Jan. 2018, Canada, Holiday shoppers up until the Black Friday/Cyber Monday period (n=457). 7 Google/Ipsos, “Shopping Tracker,” Oct.–Dec. 2017, Canada, Online survey of shoppers 13+ who return to a retailer site (n=3,281). 8 Google Data, April 2015–March 2016 vs. April 2017–March 2018, Canada. 9 Google/Ipsos, “Omnichannel Holiday Study,” Nov. 2017–Jan. 2018, Canada, Holiday shoppers’ online purchase occasions (n=1,153). 10 Google/Ipsos, “Omnichannel Holiday Study,” Nov. 2017–Jan. 2018, Canada, Last-Minute Holiday shoppers (n=609). 11 Google Data, July–Dec. 2015 vs. July–Dec. 2017, Canada.